Hey beautifuls, as I always say, I constantly look out for cruelty-free products that are derived from nature and are devoid of chemicals, today I will be discussing about a specific type of oil, that has been formulated centuries back and is a part of Ancient Ayurveda. I am talking about Dasapushpam oil. 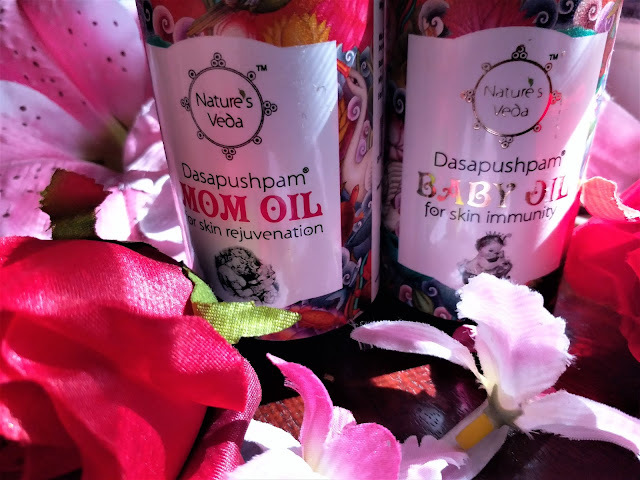 Currently both me and my baby has started using the Naturesveda Dasapushpam Oil that comes in 2 variants, for baby and for mom. Dasapushpam means 10 sacred flowers of Kerala which are infused in the purest coconut oil, producing a concoction that has multiple benefits. 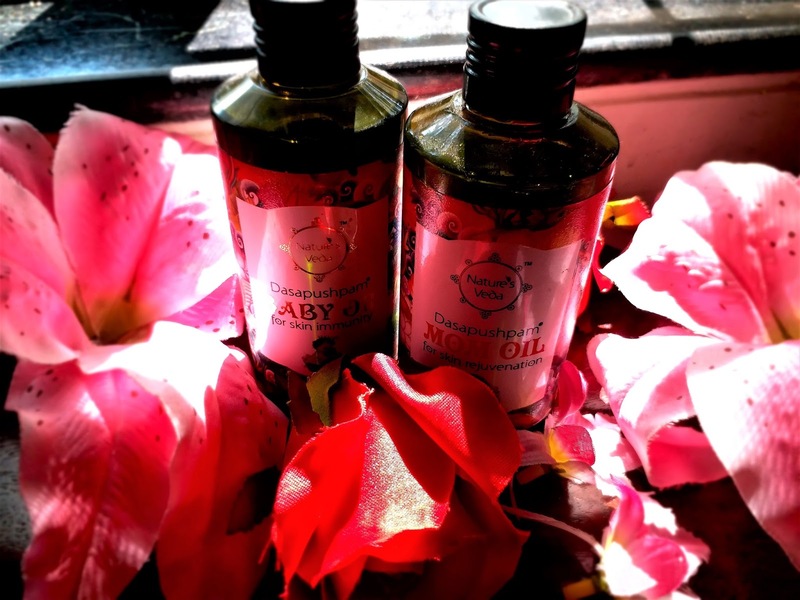 This is a great massage oil for babies to improve the skin immunity. During the growing years a baby's skin is very delicate and a little abrasion can cause serious injuries and scars. A good oil massage prior bath will ensure a protective barrier from the chemically laden harshness of the soaps and shampoos that are used. Naturesveda Dasapushpam Baby Oil for Immunity is made up of the best from nature. It has powerful medicinal value and ensures the best for your child. I am really fortunate that I have come across this oil. It is completely different from what I have been using for my baby. It gives the best results as a massage oil. I can make the difference even while in the process of massaging. The texture of the oil is quite light and almost runny. However the secure and scientific packaging makes it very easy to be poured properly. My daughter has very dry skin and often suffers from allergic reactions from Mosquito bites. 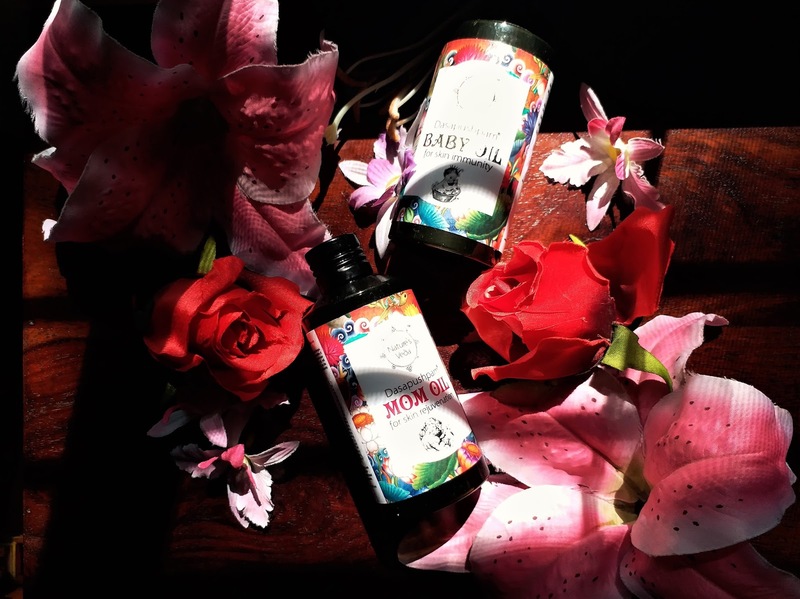 Those are the days when I generally avoid an oil massage but with this oil things are different as instead of giving a burning sensation, it actually soothes the reactions and my baby does not get irritated. Another thing that I have noticed is, #BabyAishani has always had quite dry feet and palm. I have tried oils, creams, butters but nothing had worked so far. This oil has improved the condition upto a noticeable level. Frankly I can say that it has been a best choice for my daughter till now. I will not lie, until before January, I hardly used to get time for body massage or any sort of pampering for skin. But after she has started her pre-school I get some me-time nowadays and have again started with my daily oil massage. One of the key things that I notice with my skin is loss of elasticity, specially around thigh, arms and neck. 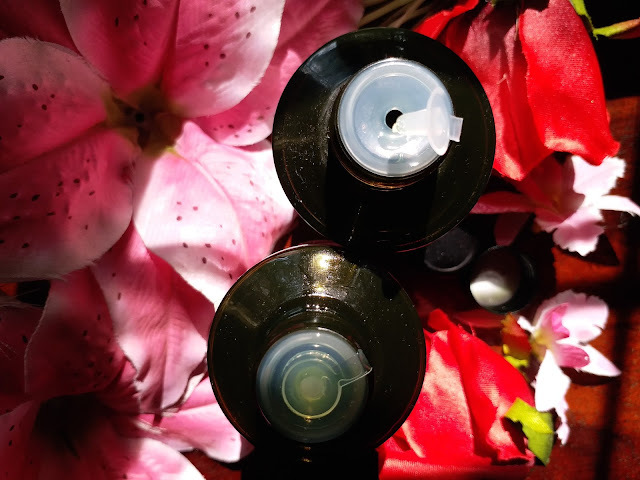 I massage daily with the Dasapushpam oil and have found a visible difference in my skin texture and also a considerable rate of toning of the skin. I am really satisfied with the results that this oil has given to my skin so far. The beautiful green colour and herbal smell of the oil is all very relaxing, quite similar to the Baby Massage oil. And my skin is left hydrated and smoother and as I said better toned. Naturesveda Dasapushpam Oils for Baby and Mom are the best offerings from Kerala's Ayurvedic rich skin care treasury. 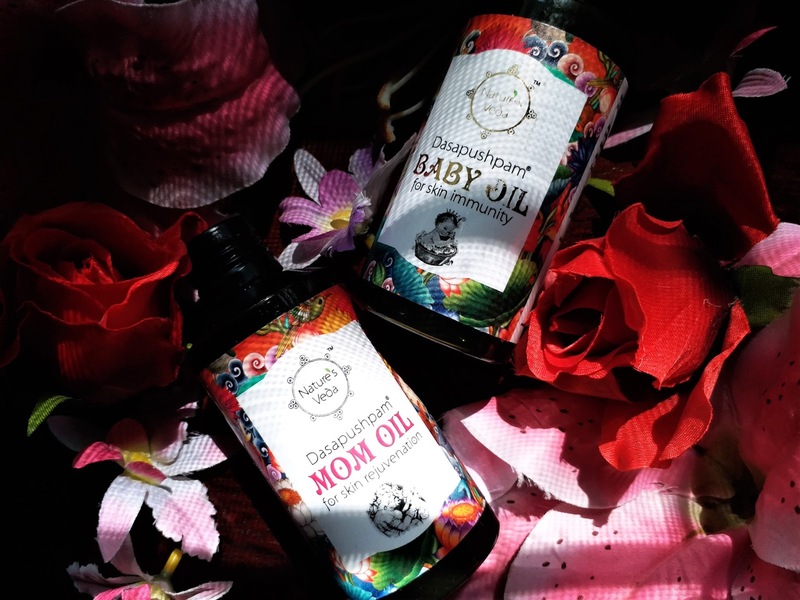 Both we, mom and baby are enjoying the oil massage session and its benefits nowadays.